(Newser) – The single-engine turboprob plane that crashed in Costa Rica Dec. 31 did what looked a "cartwheel" maneuver before going down in a wooded area, a witness says. "It was kind of low and I looked up to see it turn. I turned away and then heard the crash. It had only been in the air a minute or so," witness Matt Wolfe tells the New York Daily News. "My wife watched the whole thing. She thought the plane was doing some kind of barrel roll acrobatic maneuver." 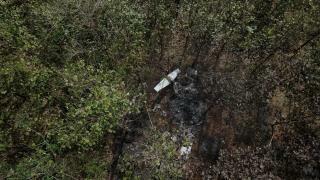 Costa Rican investigators say they believe the crash, which killed 10 Americans and their two Costa Rican pilots, was caused by either strong winds or a mechanical issue with the Cessna 208B Caravan, the AP reports. Did it make a face, a la McKayla Maroney, after doing a cartwheel and crashing? That type of plane doesn't just fall out of the sky. I think there is a lot more to this crash than we are being told or they know.